The Senco Roof 455XP Nailer has been one of the favorites and best roofing nailers for a long time not because of its extraordinary features but its great ease of use. It is comfortable on the hands, and thus one can use it for long hours without hand fatigue. You can operate it by one hand since it is light enough. To add to this, you don’t need to have very big hands to use this model, and thus women can use this tool comfortably. 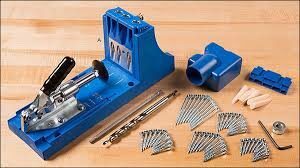 It drives a commendable range of 15-degree collated nails of ¾- 1-3/4 inches. This is a decent range and should be adaptable enough for most roofing tasks. When using a roofing nailer, it is important that exhaust air, debris, and oils don’t spill on your nailing area. To ensure this doesn’t happen, Senco Roof 455XP Nailer has a 360-degree adjustable exhaust. The depth-of-drive can be conveniently adjusted and placed below the trigger mechanism. The trigger is easy to control and has a long travel distance. Senco made it more comfortable to use by fitting a soft-rubber material on its handle. This prevents slipping during use. This model comes with a durable case that makes it easier for one to carry it to your worksite. The Senco Roof 455XP Nailer features a metal wear plate in its nail canister to reduce canister wear and improve nail feed. The shingle guide is also removable and adjustable for adaptability, and tool-free depth of drive makes tuning drive depth easier. Its trigger doesn’t have a one-fire option, and thus it is best to use it as a contact trigger, which makes it ideal for medium to large tasks. The Senco Roof 455XP Nailer comes standard with a bump/contact fire trigger as this is the most preferred style for most professionals. There is also an optional single (sequential) fire trigger that you can order and install. This will help you choose what actuation to use. This roofing nailer has a bi-metal driver blade that improves its durability by reducing wear. It also has an innovative firing valve that reduces air consumption without affecting its speed and power. This nail gun accepts ¾-1- ¾ nails. 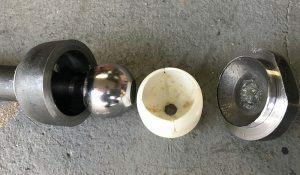 It comes with wrenches, ¼ inch swivel connector, and tool oil. You are also supplied with a case to help carry your tool easily and safely. Senco Roof 455XP Nailer offers performance and power. This model can easily drive 11-gauge nails with a length of ¾ inch to 1 ¾ inch. One good thing about this nailer is that you can adjust its exhaust to keep debris and fumes away from your working area when nailing. Adjusting the depth is also easy with this tool, and its canister can hold hundreds of nails with ease. This model is lightweight and thus ideal for any roofing task. Its paint is also extremely durable as it never chips off. This roofing nailer also comes with a case, oil, connector, and wrenches to help you quickly get started. 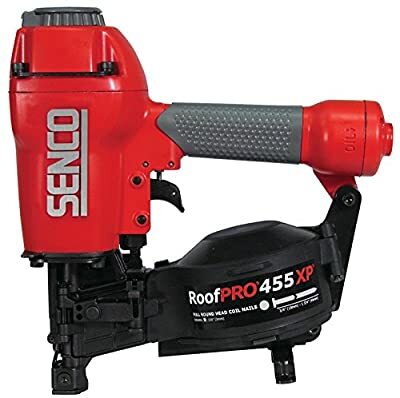 If you are a professional or DIY enthusiast and require a quality, dependable roofing nailer that can last for a long time, the Senco Roof 455XP is the right roofing nailer for the job. It has ample power for shingles/sheathing and general roofing tasks. With the right skills and adjustment, this tool can be used for sensitive tasks such as installing overhangs.